The Milescraft® Trim45™ trim carpentry aid is the handiest tool in the toolbox when it comes to installing door and window casement trim as well as decorative trim work projects such as fireplaces or book shelves. 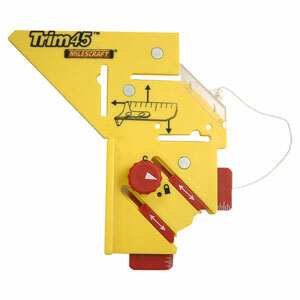 Unique measuring and marking device eliminates fumbling with tape measures when determining length of finish trim. Unique to the Trim45™ is an adjustable reveal setting ranging from 1/8" to 1/2" in 1/8" increments allowing it to be used on any project in any home or at any job site adding versatility and usability. Stick pins, tape measure slots, and rare earth magnets make accurate installation of even the largest windows a one person job. Other uses include a built in miter gauge for marking 45 degree angles, a built in square for marking 90 degree angles or setting miter blades, and tape measure slots allow marking straight lines at the depth of the set reveal.